PCWin Note: Apex WAV Merger 2.3.8.2 download version indexed from servers all over the world. There are inherent dangers in the use of any software available for download on the Internet. PCWin free download center makes no representations as to the content of Apex WAV Merger version/build 2.3.8.2 is accurate, complete, virus free or do not infringe the rights of any third party. PCWin has not developed this software Apex WAV Merger and in no way responsible for the use of the software and any damage done to your systems. You are solely responsible for adequate protection and backup of the data and equipment used in connection with using software Apex WAV Merger. 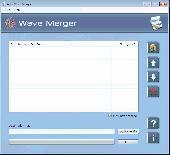 WAV Merger - WAV merger software merges two or more recorded WAVE format audio files into one large size WAVE file. WAV combiner utility combines unlimited WAV sound with a combined size of GB. Wave joining tool concatenates multiple WAV into bigger WAV format. Wave File Combiner Software - WAVE file combiner software make a single large audio from several small spread unmanaged WAV recorded music files without decreasing quality and without any mistake. This joined music you can listen with any MP3 player. HiFi WAV Recorder Joiner - HiFi WAV Reocrder Joiner is a All-in-one wav recorder, wav joiner and ID3-Editor software make high-quality recordings directly from your sound card, Join/merger multiple files into one big files, edit the id3 information for your files. Free WMA WAV MP3 Joiner - Free WMA WAV MP3 Joiner is a powerful audio tool to join MP3 files into one larger MP3 file to let you manage separated audio files better. With our audio software utility, you can instantly merge MP3 audio files without recompressing. OX PDF Merger - PDF Merger, an easy-to-use and professional pdf combiner software, can merge multiple pdf files with easy steps, 100% quality being preserved. Adobe Pdf Split Merger Professional - Pdf split merge professional edition is devised to perform pdf page editing for pdf joining, splitting, cutting, and extracting pages. Pdf joiner and splitter software combine multiple pdf files together and split large pdf files into multiple parts. Okoker Mp3 Joiner - Okoker MP3 Joiner is a powerful and ease-to-use audio editor. It builds audio joiner in one software. And you can join multiple mp3 files into one big file.It support MP3 joining. Join with high precision and no quality is lost! Okdo PowerPoint Merger - Okdo PowerPoint Merger is an easy-to-use tool for combining multiple PowerPoint presentation files and create one master presentation in batches. It supports most of popular formats, e.g., *.PPT, *.PPTX, *.PPTM, *.PPS, *.PPSX, *.PPSM. Abdio MP3 Converter - Abdio MP3 Converter is a professional software for Convert Audio Files and Play Audio Files. You can Convert MP3,MP2,MP1,MPEG,WAV,OGG,AVI,MPC,MPC+ to MP3,MP2,OGG,VOX,GSM,U-LAW,ACM,ADPCM,G.726,G.723,G721. Seal Report - Open and powerful database reporting tool. Seal Report offers a framework for producing every day reports from any database. The product focuses on an easy installation and report design: Once setup, reports can be built and published in a minute. Convert Live Mail to Thunderbird Mail - Convert Live Mail EML Files to Thunderbird without loss of single data using EML2MBOX tool. In few seconds only Convert Live Mail to Thunderbird Mail using its batch mode option.